With college almost close enough to touch, your high schooler has probably been talking your ear off about which universities they want to visit and which majors they're considering. While this is a very exciting time for your teen, you also don't want them to go into massive debt chasing their dreams. Student loan debt is running rampant today. Your teen might see student loans as an easy way to go to school without worrying about financial costs, but in reality, a heavy debt load can get in the way of their post-graduation dreams. 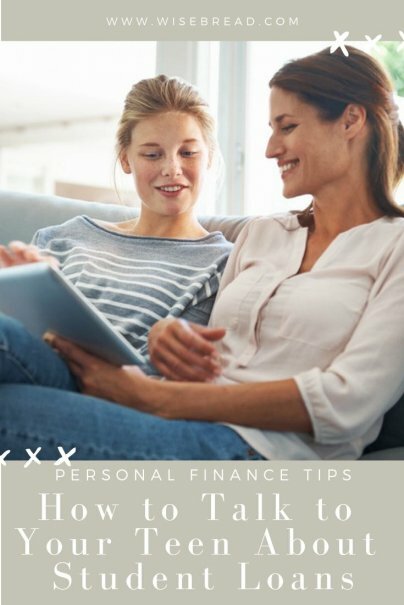 Here's how to help your teen see the big financial picture. Not only are graduates paying more money towards loans, but they're also having to delay life milestones like weddings and buying a house. Fifty-four percent of millennials have said they have limited their travel, and 40 percent have limited the amount they can spend on rent or mortgage payments. Once your teen understands how heavy student loan debt can be, they'll know they need to make other money moves in order to pay for college. They can apply for scholarships, and applying for FAFSA can make them eligible for financial aid and also school-sponsored scholarships. Encourage them to apply for scholarships regularly — as if it were their part-time job — because even a $1,000 scholarship will be highly beneficial. Encourage them to also raise money through part-time jobs and saving birthday money. Every little bit helps, especially when they're repaying student loan debt while still in college. Attending community college first can also reduce the student loan burden by half. If they don't need to take on maximum debt, then why should they? Along with going to community college first, they can test out of classes that they are already experts in, such as freshman English and math courses. This will save time and money. There are also many jobs that offer tuition assistance that are available to college students. These jobs may only offer $500 reimbursement per semester, but it's still something. There's a huge difference between federal loans and private loans. Federal student loans have better repayment options, lower interest rates, and they're more forgiving when it comes to job loss and disability. You've been providing for your child since they were born, and they might expect you to provide for them while they're in college as well. Make sure they know exactly what you'll be paying for. If you're not going to be paying for their loans, or car, or insurance, let them know so they know how to budget correctly. Your teen might be granted $40,000 worth of student loans for the year, but that doesn't mean they need to use every last dollar. If possible, they should live at home and live frugally. They don't need to buy a new laptop or make rent payments with this money. Remind them that every dollar borrowed is a dollar plus interest they have to repay after graduation. Even though your teen will have a grace period of up to six months after graduation to start paying back student loans, that doesn't mean you can't start making payments while they’re still in school. This is especially helpful if they have unsubsidized federal loans, since this type of loan accrues interest while the student is in school, during the grace period, and during any forbearance.